Hyundai is one of the most famous automotive brands and the fifth largest automakers based on manual vehicles on annual vehicle sales in the world. Hyundai is currently the fourth largest vehicle manufacturers across the globe. Not only this, Hyundai is also the world’s largest integrated automobile manufacturing facility in Ulsan, South Korea which has an annual production capacity of 2 million units. If you are dreading selling your Hyundai, or just not sure what’s the best way to go about it may be, talk to Sell My Hyundai for Cash us and check How to Sell Car Guide NZL? before you talk to anyone else. Used Car Guys will buy any Hyundai. Whether you Hyundai have a diesel, gasoline or hybrid engine, or a standard or automatic transmission, we will easily buy it. If you are worried about the scratches, dents or condition your Hyundai has, then stop worrying. We will buy your Hyundai in any condition. Regardless of its mileage, we buy any type of Hyundai. We offer free car evaluation and will offer advance payment before collecting your car. We want your ease. That’s why we will visit you anywhere you want at the time suitable to you. We assure you that you can not miss our offered price. We are offering the best prices from all. Used Car Guys offer the below exclusive services to its clients. If you’re considering selling your Hyundai or are simply looking for a car valuation, you can do both quickly and easily with Sell My Hyundai for Cash service. Hyundai is a prominent brand in the New Zealand and Australia, with models such as the Hyundai Accent and Santa Fe becoming vehicles on our roads over the years. If you have one of these models and are considering selling the vehicle, enter your reg number above to get a free and instant online car valuation. Used Car Guys will make a FIRM offer for your Hyundai. If you want to Sell My Hyundai for Cash the Simple & Secure! way,simply enter your registration number and a few simple details. We will call you back promptly with a FIRM offer for your Hyundai, based on your description. If you like our offer, we will collect your Hyundai at a time convenient to you, and pay you by cheque or secure bank transfer from ANZ or BNZ. 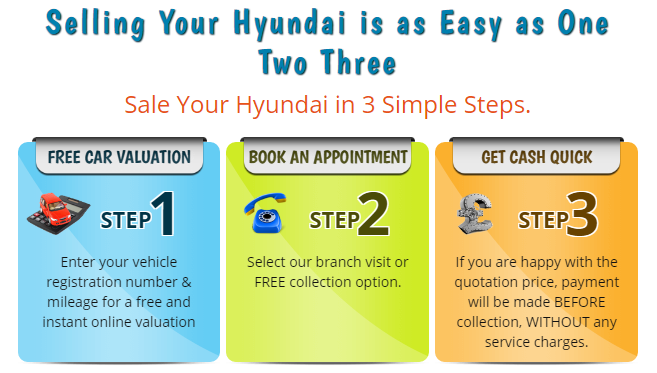 To receive a free, no obligation price for your Hyundai, please request a quote. If you have any further questions then please contact us for more information about selling a Hyundai.